Halloween Man Average 0.00/5 - out of 0 total votes. After thirteen strong years as a cult-favorite webcomic, "Halloween Man" is rolling into comiXology and Monsterverse with a new ongoing series. After a decade of smashing the troupes of Gothic Horror and Weird Science, our half-dead hero is taking on High Fantasy! Sailing through outer space in a Viking warship and arriving on ape-back, the dwarf king has come to burn Solar City to the ground. It's the undead vs. the under-sized as Earth's Weirdest Superhero rushes to save the day. This offbeat, action-packed story is brought to you by series writer/creator Drew Edward, artist/graphic designer Sergio Calvet (Magic of Myths, The Dark of the Forest), and editor Russell Hillman (Fast & Frightening -- A Comic About Roller Derby). 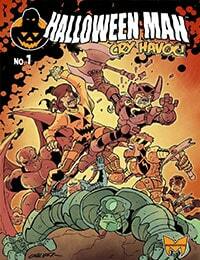 Also featuring a back-up story, "Soloman X," from Halloween Man's classic webcomic adventures. Get in on the ground floor as a whole new era of Halloween Man begins!